Father's day,a holiday to celebrate father's contribution, to express our grateful ,a day worth celebration. Although there are many ways to celebrate father's day in different regions, but most of them like to give gifts or have family dinner together, etc. On that day, Speaking of preparing gifts for your dearest father's day,What do you have in mind or you are looking for Father's day gift guide? The drone is not only for young people ,a lot of adults also like to fly it, On The Father's Day,Bring your drone,or purchase one for your father,but make sure to choose right battery,A good battery can provide longer flying time and much powerful,Gens ace battery would be a good choice. Held his hand and taught him how to fly. It would be more meaningful than just a simple dinner. Why fly drone they feel happier than others? Many parents want to be pilots when they were young, Like every man have a dream of flying,if we played with them and teach them how to fly, they would feel like back to the old times,back to the days when they were not a father,but a son,a happy childhood. With the development of society, we work day and night,left so much less time to be with our father,fly drone together,we can enjoy some quality time with our father,I am sure it would make the best father's day,for all it means is to be together,be happy ,be family,not just sit there,but heart with cellphone. Why choose the Gens ace&Tattu lipo battery? Gens ace & Tattu, a specially designed UAV battery brand, their lipo battery has a more flight time and stability for drone. 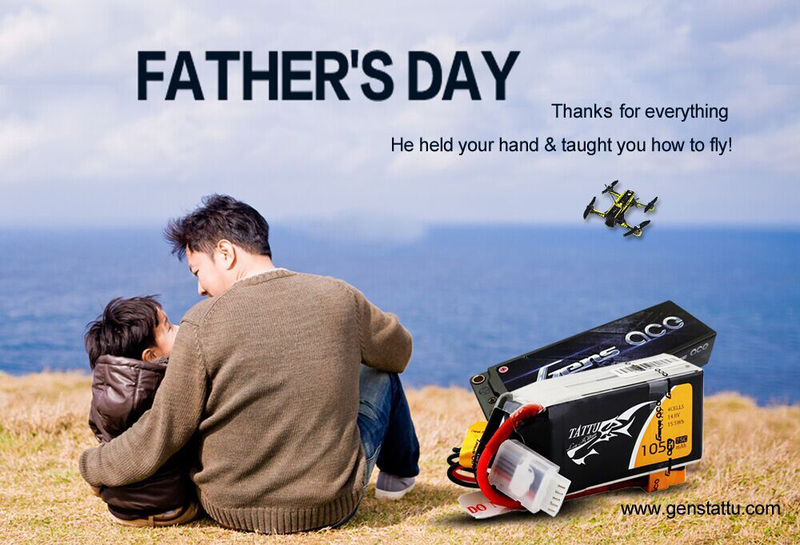 If your father like RC,you can play with them together,and give Gens ace lipo battery on Father's day. Let you and father have a long pleasant flight journey.